This is certainly not a sight you encounter often. 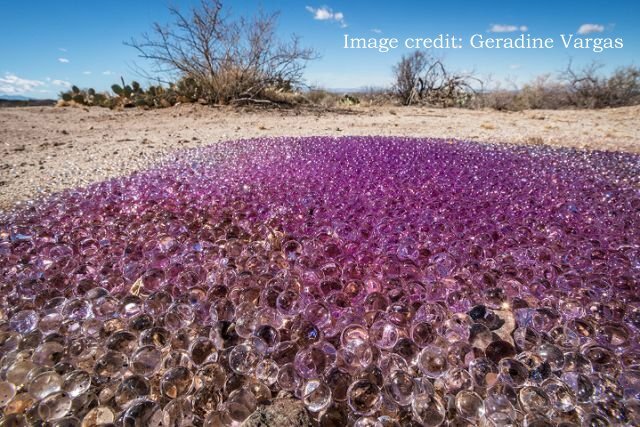 Thousands of tiny, purple-hued spheres piled in the middle of nowhere were found in the Arizona Desert by Geradine Vargas and her husband last year. We were taking photos around the area and we just…. I mean, how could you miss this? Geradine said. It was just like glittering in the sun. Its just one of those things that youve never seen before. We did email a friend of ours whos a zoologist, but she didnt know. I mean, she didnt seem to recognize what it was. Geradine sent KGUN-9 pictures of the spheres, hoping they could find some answers. KGUN-9 reports We checked out the mysterious spheres for ourselves, and learned they were still there. Theyre like gooey marbles that ooze out a water substance when squished. They roll, they shine, and theyre out of this world. We spoke to Darlene Buhrow, director of marketing at Tucson Botanical Gardens, whos husband is a botanist. He said if these are something naturally occurring, they could be a slime mold or jelly fungus. 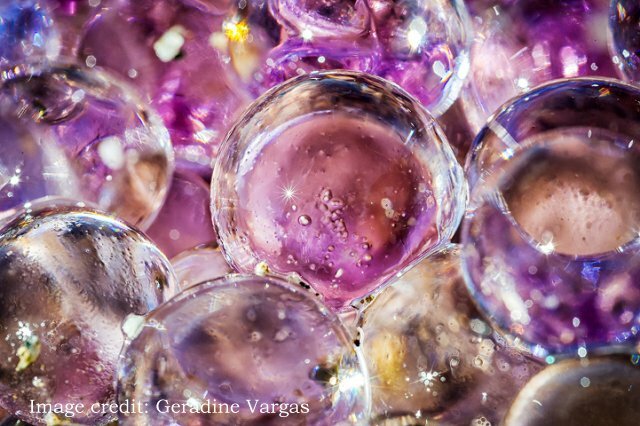 Weve received tons of calls into the newsroom tonight from viewers who think they are a product like Deco Beads, which are tiny, colored, water-filled spheres that keep plants hydrated. No one is positive what these spheres are, and for now, all we can say for certain is that theyre definitely out of the ordinary.